Yesterday’s game recaps and some injury updates in today’s NHL morning coffee headlines. NHL.COM: Jonathan Toews and Patrick Kane each had five points leading the Chicago Blackhawks to an 8-5 victory over the Washington Capitals, handing the defending Stanley Cup champions their fifth straight loss. All of Washington’s goals came from defensemen, with John Carlson scoring twice. 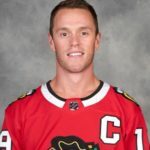 Chicago Blackhawks captain Jonathan Toews tallied a hat trick in an 8-5 win over the Washington Capitals (Photo via NHL Images). SPECTOR’S NOTE: Maybe the Capitals haven’t fully shaken off the dreaded “Stanley Cup hangover”? Over the last couple of weeks, they’ve looked like a club in need of a rest. New York Islanders goaltender Robin Lehner made 19 saves to earn a 3-0 shutout over the Anaheim Ducks. Cal Clutterbuck scored two first-period goals for the Islanders, who picked up their fifth straight victory. SPECTOR’S NOTE: With the win, the Isles (62 points) opened a three-point lead for first place in the Metropolitan Division over the Capitals and Columbus Blue Jackets. So, Lou Lamoriello for GM of the year and Barry Trotz for coach of the year? The Vancouver Canucks moved ahead of the Ducks and Minnesota Wild into the second wild-card spot in the Western Conference by edging the Detroit Red Wings 3-2. Canucks rookie sensation Elias Pettersson celebrated his return to action after missing five games with a knee injury with a goal and an assist. SPECTOR’S NOTE: The Canucks are definitely giving their fans something to cheer about this season. Their playoff chances will improve if Pettersson can stay healthy the rest of the way. Vinnie Hinostroza’s third-period goal proved to be the game-winner as the Arizona Coyotes doubled up the slumping Toronto Maple Leafs, who’ve won just three of their last 10 contests. Leafs winger Andreas Johnsson left the game in the second period with a concussion following a hit by Coyotes defenseman Niklas Hjalmarsson. SPECTOR’S NOTE: The Leafs (60 points) sit second in the Atlantic Division but the Boston Bruins and Montreal Canadiens are nipping at their heels with 59 points. Nino Niederreiter scored his first two goals since joining the Carolina Hurricanes in a 7-4 drubbing of the Edmonton Oilers. Lucas Wallmark also scored twice for the Hurricanes while Leon Draisaitl tallied twice for the Oilers. SPECTOR’S NOTE: The Oilers managed to make a game of it by cutting a 6-1 lead to 6-4 but Wallmark’s second goal of the game late in the third snuffed out Edmonton’s comeback attempt. Gotta wonder how much longer the Oilers will stumble along before general manager Peter Chiarelli makes a trade, provided he’s not fired first. NBC SPORTS BAY AREA: The San Jose Sharks placed defensemen Erik Karlsson and Marc-Edouard Vlasic on injured reserve. Karlsson’s undisclosed injury could jeopardize his participation in the upcoming NHL All-Star Game in San Jose. I would have to say that Chia is going to be fired or should be, let a new guy come in and deal with whats left. I don’t ever cheer for any other teams in the Met but I really enjoy Mathew Barzal and the Islanders. They are kind of this years Golden Knights. Everyone picked them to finish last and they are exceeding expectations. Trots May deserve some credit but Lou hasn’t done anything to be able to take credit for it. It’s not a cup hangover for the Caps so much as the fact that their roster is not really that good and they overachieved last year significantly. That division is the tightest it’s ever been. Less than 5 points between first place and out of the playoffs status. It will likely come down to the last games of the regular season to see who makes the playoffs and who doesn’t. The Penguins have the longest active consecutive playoff streak but they possibly could be on the outside at the end of the season. I don’t see their leadership group allowing that to happen but it’s still possible. My prediction is Chiarelli makes a trade first.